Hope you're all well, I've got another mad busy week ahead of me, some which I'll tell you about at the end of this post! So,following on from last weeks post, I've got another great small independent retailer to introduce you to today. The lovely Patty contacted me last week to let me know that her business Miss Difusa was up and running and asked if I'd like to try out some of their tights. 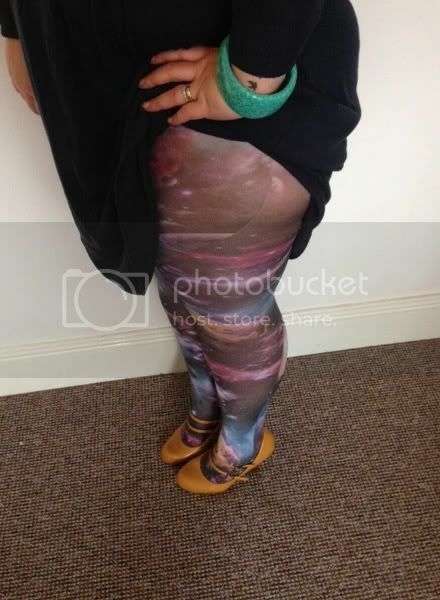 I was sent the very bold Cosmic print tights to try out. I'll be completely honest, when they arrived and I saw they were the Pamela Mann brand, I was a little scepticle. I've had their tights before and they've not been great, I struggled to get them on let alone wear them for any length of time. And on removing them from the packet I was quite alarmed at the shape of the tights. They had a very shallow crotch area. But I'm pleased to say, they were very stretchy, and went on very easily. They stayed in place all day and were very comfortable to wear. 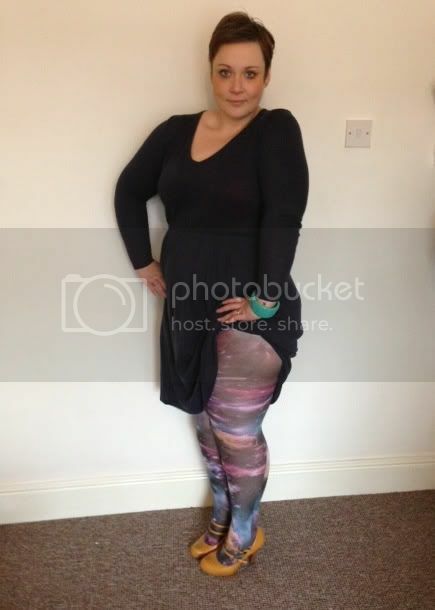 I was pleasantly surprised with the tights, and will definitely be trying out some more of the range, I did size up to the 26-30 as I'm 5'7" and have really chunky thighs, they fitted perfectly though! I look forward to see what Miss Difusa has in store for the future and Thanks Patty! Oh yeh, and my busy week? Well firstly I'm going to Leeds on Wednesday to meet with the guys at Best British Bloggers with my Plus North hat on, and then on Saturday morning I'm travelling down to London to attend the British Plus Size Fashion Weekend, I'll be covering the event for F&F Clothing, so watch out for tweets, blogs and Facebook activity around that, there will also be a giveaway too! Exciting stuff! 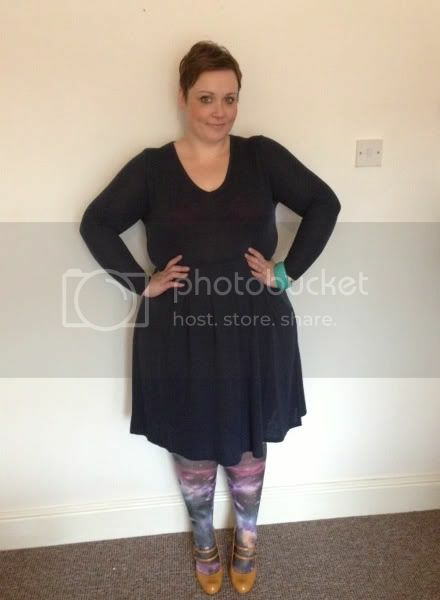 You look gorgeous & I LOVE those tights! This is amazeballs. 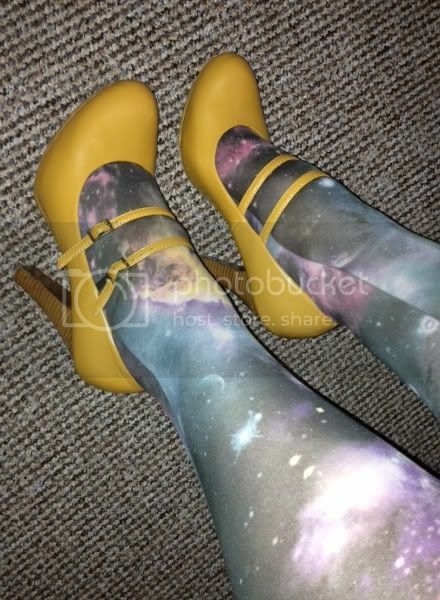 The way those shoes pop against those tights is brilliant. Admittedly, galaxy print and mustard yellow are two of my favorite things in the WHOLE world but, I can't imagine anything looking better than this outfit. Tights that don't fit properly drive me nuts! I like them right up at my waist, none of this hipster thing, too uncomfortable! I find myself popping a pair of large Granny pants over the top of hipster ones to stop them falling down..not a great solution, but it's happening more and more often!